Civil War Quiz – What Do You Know About George Henry Thomas? Q#1 – In what state was George Henry Thomas born? Q#2 – In 1831, what incident occurred that forced the Thomas family to flee from their home and hide in the nearby woods? Q#3 – While a cadet at the West Point Military Academy, what nickname did the other cadets give to George Thomas? Q#4 – What person who would gain enormous fame fighting for the Union during the Civil War was Thomas’s roommate and close friend? Q#5 – After graduating from West Point in 1840, what military unit in the army was Thomas first assigned to? Q#6 – In 1851, Thomas returned to West Point in what capacity? Q#7 – When Thomas returned to West Point in 1851, who was the Academy Superintendent with whom Thomas would eventually establish a close professional and personal relationship? Q#8 – During Thomas’s long military career both before and during the Civil War, what was the only wound he suffered in combat? Q#9 – At the outbreak of the Civil War, being a Southerner, Thomas struggled with the decision on which side to join, but opted to remain with the United States. What was thought to have been the main factor in his decision-making? Q#10 – On January 18, 1862, where did Thomas win the first important Union victory in the war defeating Confederate Brig. Generals George B. Crittenden and Felix Zollicoffer? Q#11 – In the fall of 1862, what military command did Thomas refuse to accept? Q#12 – After the battle what future president who was a field officer for the Army of the Cumberland was instrumental in Thomas becoming became widely known by the nickname “The Rock of Chickamauga”? 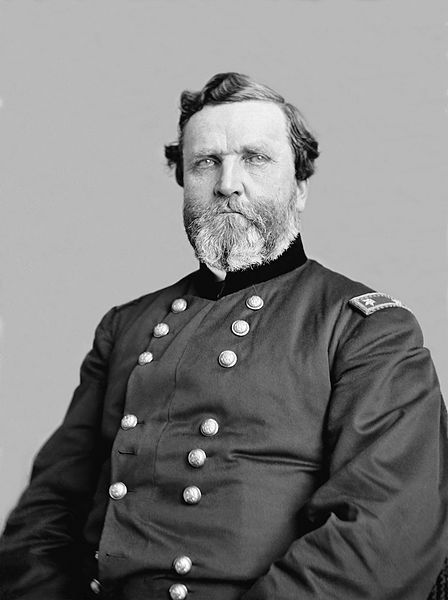 Q#13 – Prior to the Battle of Franklin on November 30, 1864, why did General US Grant send Maj. Gen. John A. Logan to Tennessee with an order to replace Thomas? Q#14 – After Thomas’s decisive victory at the Battle of Nashville, what other nickname was given to him? Q#15 – Thomas died on March 28, 1870, at the age of 53 while serving in San Francisco, California, as commander of the Military Division of the Pacific with headquarters at the Presidio. What was the cause of death? This entry was posted in Quiz on March 27, 2016 by hlj.